Soldiers suffered from a variety of illnesses and injuries during the course of the war, and many soldiers were hospitalised on more than one occasion. Medical services were relatively primitive, and many of today’s life-saving antibiotics were yet to be discovered. Minor injuries, therefore, could prove lethal. Vaccination in the early 20th century was not as prevalent as it is today, hence communicable diseases such as mumps, dysentery, typhus, and cholera were very common. The occurrence of such illnesses was exacerbated by poor sanitation in the trenches, and many more soldiers died of illness than of gunshot wounds, gas attacks or shell fire. Respiratory diseases such as influenza, tuberculosis, pleurisy and pneumonia were rife, as were scabies, pediculosis (lice) and other parasites. Body lice caused trench fever, resulting in headaches, aching muscles, skin sores and a high fever. Many soldiers became victims of trench foot, caused by prolonged exposure to wet and unsanitary conditions. Their feet would become numb, turn red and swell, often developing blisters and open sores. If left untreated trench foot usually resulted in gangrene, which required amputation. In an attempt to minimise trench foot soldiers were paired together, each soldier responsible for his partner’s feet, ensuring that wet socks were removed at the end of each day and dried. 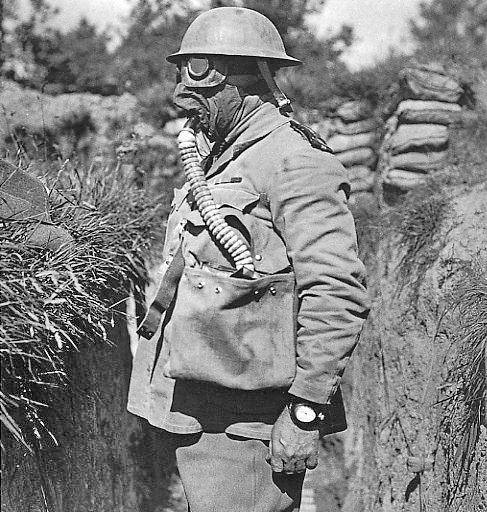 Chemical warfare was first employed by the Germans in October 1914. Chlorine gas – a greenish vapour – induced choking and vomiting, taking soldiers totally by surprise. Soldiers were advised to covers their mouth and nose with a cloth soaked in urine; the ammonia in the urine neutralised the chlorine. Other gasses were colourless and odourless and caused blistering of skin and airways, congestion of the lungs and blindness. Symptoms were not always immediate, but would develop over several hours. Death took up to 5 weeks during which victims were tied to their beds while they slowly suffocated. The gas remained active in the soil for several weeks. The box respirator mask was developed in 1915 at Melbourne University and was standard issue for allied troops by 1917. Nicknamed “The Exasperator”, it was uncomfortable and cumbersome, making it difficult to talk, sneeze or sleep. Although thousands of Australians were affected by gas, only about 200 died from it, a very small number considering overall casualties. Sexually transmitted diseases such as syphilis and gonorrhoea were not uncommon. Soldiers’ medical records would include a case sheet, detailing where and when the disease was contracted, and who from. Their name would also be placed on a register. Treatment consisted of injections of mercury and 606 – arsphenamine – the first modern chemotherapeutic agent. Afflictions were not only physical, soldiers also suffered from psychological and emotional trauma. “Shell shock” was first recognised in February 1915, just six months after the commencement of the war. Little understood at the time, the condition is now recognised as post-traumatic stress disorder. Symptoms ranged from fatigue, irritability, headaches and lack of concentration to facial tics, diarrhoea, hysteria or catatonia. Shell shock was generally considered to be the result of cowardice or a lack of moral fibre. It was not recognized as an official medical problem, and soldiers were usually punished, often receiving a court martial and even sentenced to death. Indeed, the British and Commonwealth military command executed 306 of its own soldiers during the course of the First World War, including five New Zealanders. The Australian government refused to allow any Australian soldiers to be executed. This entry was posted on March 6th, 2014.